Artificer deals with the Wizards' ability to create "mini-artifacts" and equip them to their Academy creatures. In order to be able to create these artifacts, the Arcane Forge must be built in the town, costing 3000, and 1 of every resource. Only Wizards, with the Artificer skill, can use this building. When creating these mini-artifacts, the Wizard bestows various effects onto the artifact, enhancing the statistics of the creature to which it is attached. The complete list of these effects can be found below, along with their resource requirements. Note that the same effect can not be used more than once per mini-artifact. Up to three different effects can contribute to one artifact, depending on the Wizard's mastery of the Artificer skill: 1 effect for Basic Artificer, 2 for Advanced and 3 for Expert. The cost of each subsequent effect is also progressive: the first one costs 5 of each of its associated resources, the second costs 10 and the third, 15. Note that the order of the effects does not influence the resulting bonus to statistics, though it does change the total cost of the mini-artifact. Remember to test the various combinations, and wisely choose a combination that best suits your resource availability accordingly. The fourth and most powerful mastery of the skill, Ultimate Artificer, reduces the total cost of creation by half. Each Mini-Artifact effect will boost a creature stat, as detailed below. The power of the effect depends on the Knowledge (K) of the hero creating the artifact. Formula: see table. The value is capped to 85%. For example, Iron Golems (50% magic protection) with a +34% magic protection artifact would have a total magic protection of 67%. Magic resistance and magic protection should not be confused: 25% resistance gives a 25% chance to evade the magic attack, while 25% protection systematically reduces the damage of magic attack by 25%. During the construction process, you will be able to select a global mini-artifact 'type' that it will be considered as. The type itself has no impact on statistics whatsoever. Each come in three tiers, depending on Artificer mastery and the number of effects it has associated with it. Once created, the mini-artifact can be equipped to one of your Academy creatures. Note that only one artifact may be equipped to a creature stack at a time. The creature statistics panel displays the information about the equipped artifact, if one is present. Of course, you will be able to remove it by clicking on the creature on the 'equip panel'.If you don't remove it, and equip another one, the old one will simply be replaced. This prompts the player to think about what creature he/she will be creating the mini-artifact for, and hence which statistics to improve. Seeing as you are able to remove an artifact from a creature, you can use it back and forth between different stacks. However, you will need to be in an Academy town with an Arcane Forge built to do so. Note that mini-artifacts are carried either by the creature stack when equipped, or by the hero when not equipped. However, there is no user interface to enable you to view them outside of the Arcane Forge. Artifacts are never lost when upgrading, joining or splitting stacks. When joining two stacks both with an artifact equipped, one is kept on the resulting stack. The other one falls back to the hero's stash, and is available to be equipped to another stack. When a stack is killed or dismissed, its mini-artifact is lost. 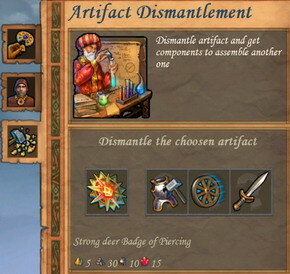 Finally, if mini-artifacts can be created for a cost, they can also be dismantled. The components will be extracted, meaning you will receive the resources back. For example when your hero levels up and you want to upgrade your mini-artifacts by adding more effects to them, you can dismantle the mini-artifact, and re-decide or upgrade its current effects. Allows hero to create creature equipment of the first level. Allows hero to create creature equipment of the second level. Allows hero to create creature equipment of the third level. Reduces the price of creating creature equipment by half. Special combat ability. Allows hero to consume artifacts equipped on friendly creatures to heal and resurrect it in combat. Every damaging or cursing spell cast by the enemy has a chance to be randomly reflected to some other target, including enemy units. Special combat ability. Caster binds himself to the target with Mark of the Wizard until the end of combat so that each subsequent spell striking that target has its effect doubled and costs as much mana as needed for this double effect. Moreover every spell striking another creature will affect this target as well. If there is not enough mana, the effect is not doubled. All spells that are in existence will be written to the hero's spellbook and the hero will be able to cast them on expert level. Arcane Omniscience is one of the truly "ultimate" abilities. The path to this ability is fairly favourable (though perhaps, restricted in terms of the loss of Light Magic), picking up skills like Enlightenment along the way, but it provides, in essence, a double bonus. Your hero learns every spell, but the main drawcard is that he/she is able to cast them at Expert level. This theoretically means he/she has acquired Expert Dark Magic, Destructive Magic, and so on, therefore skipping the usual number of level-ups (not to mention skill slots) needed to develop these skills. Of course, they are devoid of their respective abilities, but even so, the possibilities become far greater. However, due to the late-game nature of Ultimate Abilities, the Library is still recommended if a spell like Phantom Forces or Righteous Might does not show its hand. You can discuss Heroes V racial skills with the Heroes Community.